Finished yet another of my afghans - I really like these - they don't take too long to make and have no boring sewing up to do as the borders are all knitted on or applied. This one is very special - my very first friend on the internet - from way back in 2001 - has just been diagnosed with lung cancer. Dear Marguerite has never smoked in her life!! 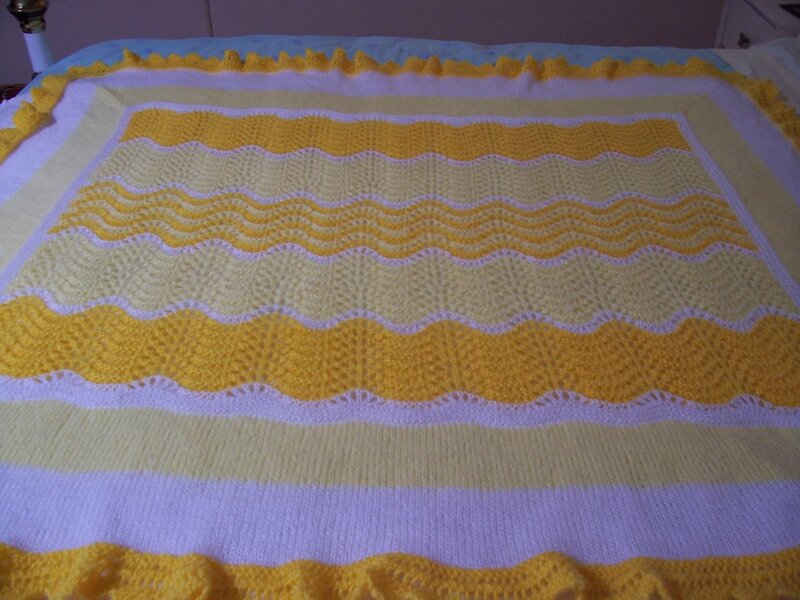 Her favourite colour is yellow - so I designed this one in two different yellows and married it to white to match her name . I do so hope she likes it - I made it in the softest fluffy acrylic - so that she doesn't have to worry about special washing needs or anything. She has enough to cope with - she had her second lot of chemo last Thursday 26th October, and she is OK - very determined to beat this! A lot of loving thoughts went into this, as well as lots of prayers - I hope this will be a comfort to her later on when she has her surgery.